Which Nonprofit Outlets Won’t Call Washington’s NFL Franchise by Name? You know who they mean. 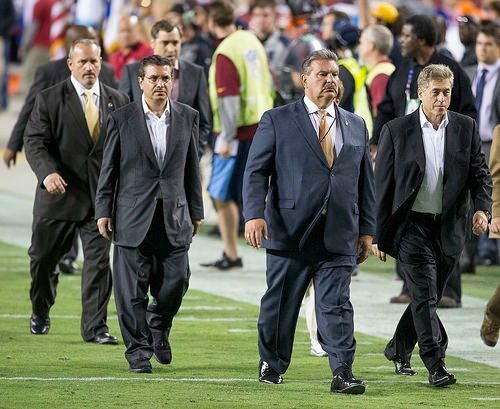 It’s that team in Washington, D.C. that’s owned by Daniel Snyder. It plays in a stadium in Landover, Maryland. A young superstar is the quarterback, the team has a top flight receiving corps, it upset the dreaded Dallas Cowboys in JerryWorld…but the team has that awful, racially disparaging name. Increasingly, the media won’t use the name. It’s not out of political correctness. It’s because of disgust that a twenty-first century team could be named for a racial slur. The Columbia Journalism Review published a list of sports media celebrities, such as Peter King of Sports Illustrated, Greg Gumbel and Phil Simms on CBS, and former NFL head coach Tony Dungy on NBC, who won’t use the word. Among media outlets, the newspapers and magazines that reject the word include the Oregonian, the San Francisco Chronicle, the Seattle Times, the Detroit News, and the Salt Lake Tribune. CJR also mentioned one other nonprofit outlet: Mother Jones. Add Nonprofit Quarterly, too. We’ve been not only rejecting the use of the word, but campaigning against it, particularly because of the team’s creation of a foundation to buy its way into the Native American community’s goodwill.